October 15, 2018 | BY: Trinh Le, R.D. October 15, 2018 Trinh Le, R.D. In not-so-breaking news: Not all calories are created equal. A serving of grilled salmon is more nutritious than a serving of fried chicken. So, if you’re trying to lose weight, you need to be smart about your calories: Cut the calories you don’t need and focus on the quality of the calories that you are eating. With that in mind, we’ve put together 13 easy ways for you to cut 100+ calories every day. Just follow one or more of these tips on any given day. Pro tip: Use Portion Fix containers to make sure your food portions are on point. Your morning meal is an important one, but like any meal, it can be easy to go overboard at breakfast (we’re looking at you, buttermilk pancakes with syrup. And whipped cream). Pick easy, make-ahead recipes that include ingredients high in fiber and/or protein, like sweet potato egg cups or blueberry banana oatmeal muffins. Fill your tank with filling, nutritious foods in the morning and you’ll be less tempted to stop for an apple fritter (460 calories) or a sausage-egg biscuit (470 calories) on the way to the office. This may save you about 140 calories each day. Gotta get your fancy latte fix? Hate to break it to you, but even a 16-ounce plain latte (no sugar added) has about 190 calories. A 16-ounce vanilla latte contains about 250 calories. To add insult to injury, most of those vanilla latte calories are coming from added sugar (35 grams), which is linked to weight gain. 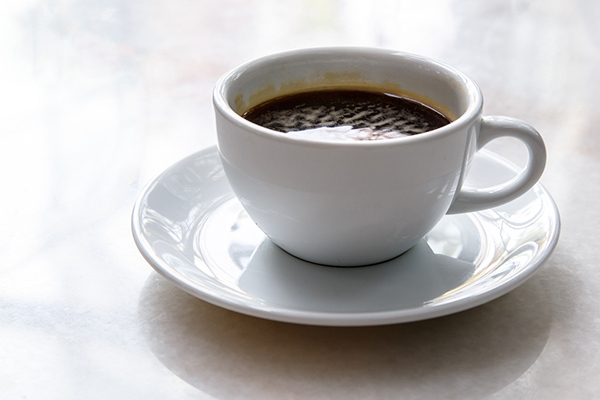 The good news: Swap your plain latte for a 16-ounce cup of black coffee, which is a measly five calories. Sass it up with cinnamon or two tablespoons of half and half (50 calories) and you can easily save yourself about 140 calories every day — and money to boot. If you’ve gotta have your flavored latte, you still have some options: Ask for fewer pumps of syrup, swap to sugar-free syrup if available, or switch to low-fat milk. Pro tip: You won’t save a lot of calories by swapping in almond, soy, or coconut milk — most coffee places only offer sweetened versions, so make sure to ask first. Research shows that people who drink soda don’t eat fewer calories to compensate for the extra calories they’re consuming, which is what normally happens when you eat solid food. If you can’t quit soda cold turkey, dial down the amount gradually until you get there. Eliminating one 12-ounce soda daily saves you up 56,575 calories and over seven pounds of sugar every year! Swap in broccoli, cauliflower, zucchini, carrots, butternut squash, kale, spinach, peppers, and onions wherever you can! Vegetables are lower in calories, higher in fiber, and full of vitamins and minerals. Trading one cup of cooked pasta with one cup of broccoli can save you as much as 180 calories. But remember that carbs are not the enemy; your body needs carbs for fuel and nutrition. Just make sure your carbs are coming mainly from healthy sources like vegetables, whole grains, and fresh fruit. Pro tip: Take it a step further by swapping spiralizing vegetables instead of noodles or cauliflower “rice” instead of white rice. 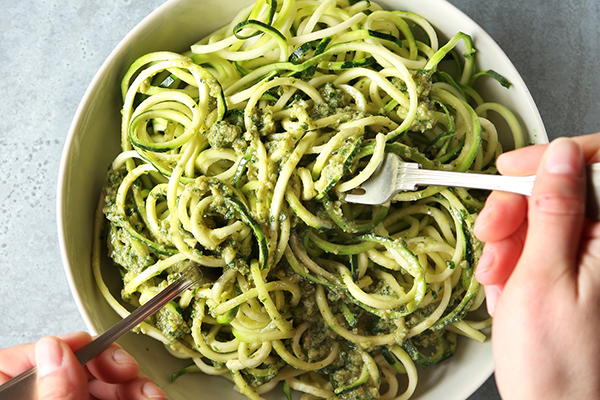 Try this pesto zucchini noodles with chicken or chicken and cauliflower fried rice. Visual cues like the size of a box or bag can subconsciously drive us to eat more — or less. For example, women and men who were offered a 170-gram bag of chips ate 18 percent and 37 percent more, respectively, than when offered an 85-gram bag. If you eat 400 calories in snacks daily, portioning out your nibbles can save you between 70–150 calories. Pro tip: Check out these 55 snacks that are less than 150 calories. Making your meals at home means you’re in control: You know exactly what ingredients (and how much) are being added to the pot. 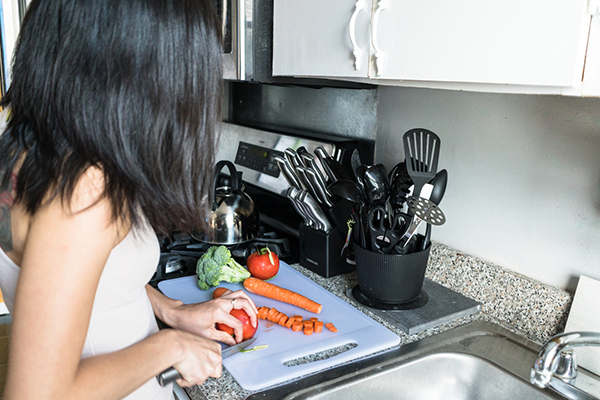 A study by the Johns Hopkins Bloomberg School of Public Health found that people who cook at home frequently eat fewer calories than people who don’t cook at home. These home cookers consumed about 140 fewer calories daily, or 51,000 calories annually. But check yourself in the kitchen, Gordon Ramsey: Just because you’re eating food you cooked at home doesn’t automatically make it healthy; you can just as easily overdo the butter, salt, sugar, etc., if you’re not careful. The solution: Stick with nutritious, balanced recipes that are filling and delicious. Over the past few decades, portion sizes have slowly gotten larger. It makes sense that plate size has also kept pace — between the 1900s and today, plate size has increased 23 percent, from 9.6 inches to 11 inches. It sounds small, but it can impact how much you eat. In his book Slim by Design, food psychology researcher Dr. Brian Wansink claims that people eat 22 percent more from 12-inch plates compared to 10-inch plates. Given that the average American’s dinner is 750 calories, this can potentially lead to a 165-calorie savings daily. This fruit is a darling of the nutrition world because it contains over 20 vitamins, minerals, and phytonutrients plus good-for-you monounsaturated fats. Two tablespoons of avocado is about 50 calories, compared to 180 calories for mayo and 200 calories for butter. Use creamy avocado on egg toast, stuffed into sandwiches, or mixed into brownies. You can save up to 150 calories for (roughly) each ounce that you eat. If you’re thinking, “Wait, what? 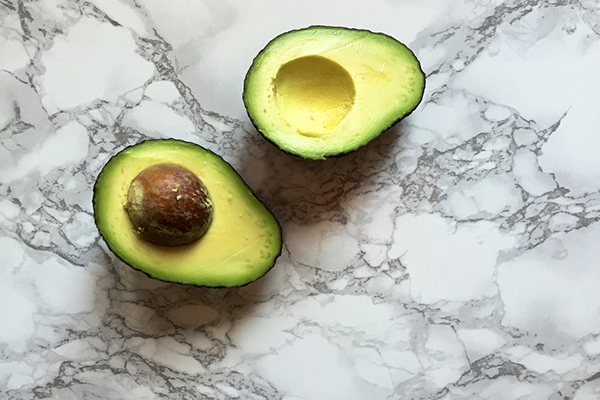 How do I bake with avocado? !” Take a gander at this fudgy avocado brownie recipe (less than 150 calories per serving!) to see how. Ordering veggie-loaded salads when you eat out is a great choice if you want to lose weight, but not if those salads are drenched in dressing. Eating just two tablespoons less of ranch dressing or Italian vinaigrette will save you 128 and 100 calories, respectively. Ask for your dressing on the side so you control how much dressing to use. Pro tip: Slow your roll on those salad toppings — dressing is the obvious calorie culprit, but they add up once you start adding cheese, nuts, croutons, raisins, etc. When you eat that healthy salad at home, you can make it even healthier by whipping up your own homemade dressing: Try a healthier ranch dressing or lemon tarragon vinaigrette. There’s no question you should eat fruit to satisfy your sweet cravings instead of a candy bar. Keep in mind that fresh, whole fruits are best — while dried fruit is certainly healthier than a candy bar, it can contain almost as much sugar as one. A piece of dried fruit contains about the same amount of natural sugars as a piece of fresh fruit, but store-bought dried fruit often contains added sugar, so make sure to check the label. It’s also easy to overeat dried fruit since the volume is reduced when you remove the water from fruit. According to the American Heart Association, a serving of fruit is a ½ cup of fresh fruit or ¼ cup of dried fruit. Case in point: You can cut 260 calories (and 50 grams of sugar!) by eating 100 grams of fresh mango instead of dried, sweetened mango. Given the choice, always go for low-fat cooking preparations like baked, broiled, steamed, and sautéed over pan-fried, fried, or deep-fried. For example, half of a fried chicken breast is 364 calories, while the same amount of chicken that has been roasted is 193 calories, saving you 171 calories. I get a sinking feeling each time I study The Cheesecake Factory menu and discover that even the herb-crusted salmon is 920 calories! And it’s not just big chains that serve up big calorie bombs, either. A 2013 study found that local/non-chain restaurants average 1,200 calories per meal, and concluded that 92 percent of meals exceeded what you should eat in one sitting. Instead of walking out decidedly stuffed, share your meal or exit gracefully with a to-go box in hand. It’ll save you up to 600 calories — and you have another meal ready to go! Virtually everyone gets a food craving at some point, and it’s usually for something salty, carby, creamy, or sweet. Figure out what you regularly crave, and find a lighter swap to satisfy it. For example, I replace my weekly (don’t judge!) ice cream cravings with these frozen banana pops. I get something icy and sweet and I save 113 calories compared to my usual cup of strawberry ice cream. Replace French fries with zucchini fries. Replace regular cheesecake with lime cheesecake cups. Replace brownies with these flourless brownies. If you’re just starting out on your weight-loss journey, these 13 tips can help you cut calories and transition to healthier eating habits. Cleaning up your diet is half the weight-loss battle, so don’t stop there — combine your new healthy eating plan with consistent, challenging workouts. You won’t get six-pack abs by eating kale salads and kicking it on the couch all week; work on your nutrition and fitness and you’ll get the results you want.